As the Arizona Fall League winds down, Peter Alonso is determined to finish on a high note. 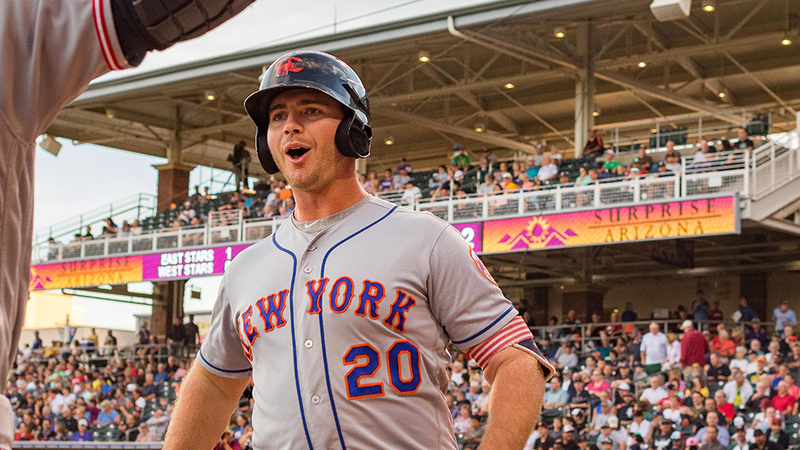 The second-ranked Mets prospect broke out of a 5-for-42 slump with a huge night Wednesday, ripping a home run, two doubles and a single while driving in six runs to key Scottsdale's 10-3 victory over Peoria at Scottsdale Stadium. Alonso's homer was his sixth, tying him for the AFL lead with Peoria's Braxton Davidson (Braves), who went 0-for-4 on Wednesday. Alonso's 27 RBIs rank second behind top Brewers prospect Keston Hiura, who has 33 RBIs after belting his fifth homer for Peoria. Alonso had plenty of help as Reds No. 2 prospect Taylor Trammell tripled, singled twice and scored three times, Abraham Toro, theAstros No. 21 prospect, collected a double, a single and three runs and Ronnie Dawson (Astros) singled twice and drove in two. Houston No. 24 prospect Trent Thornton allowed just one hit in 2 1/3 innings in relief of eighth-ranked Astros prospect J.B. Bukauskas, who gave up three runs on five hits -- including two homers -- in 3 2/3 innings, but picked up the win to improve to 2-1. Brewers No. 19 prospect Trent Grisham went deep against Bukauskas. Austin Allen, the 25th-ranked Padres prospect, singled twice and crossed the plate once for Peoria. Rays right-hander Brandon Lawson (2-2) was tagged for four runs on six hits in one inning.